How to convert mkv file (with multiple audio track) to ogv format by presrving all the audio track? Is it possible to create a ogg file (audio) with multiple track? In Linux, you have a universal media conversion program called avconv (alternatively ffmpeg). In basic form it is controlled by extensions, so avconv -i input.mkv output.ogm will do the proper conversion. input stream is used as a presentation sync reference. A "-" character before the stream identifier creates a "negative" mapping. It disables matching streams from already created mappings. must correspond to a defined output link label in the graph. will map the input stream in INPUT identified by "0:1" to the (single) output stream in out.wav. And yes, you can store multiple tracks, and even video and text, in OGG file, because it is a universal media container. 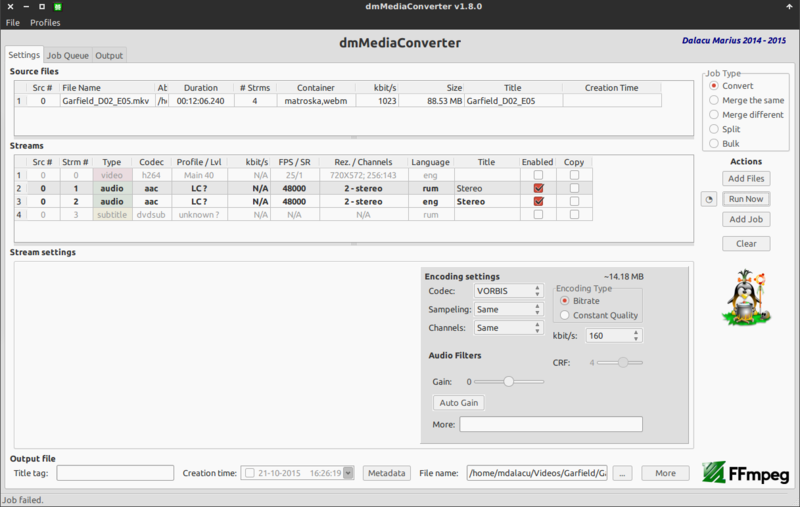 You can use dmMediaConverter and in Convert mode and put ogg or ogv extension in the output file like audio.ogg. Also, uncheck "Enable" on video stream it is audio only. You can copy the streams if them are accepted by this container. h264/h265/vp8/vp9 is not accepted by ogg. First use ffmpeg to identify the audio stream encoding. Then use ffmpeg to extract the audio stream (in original encoding). Then, if you really want you could re-encode it to ogg. But it might be most useful to keep the original audio encoding. Then use ffmpeg to extract the audio stream (in original encoding to .mka format). Note: Whenever you are in doubt (don’t know what extension to use), then you can simply use the ‘.mka’ extension (‘output.mka‘). Because ‘MKA’ container format can store a huge number of audio codecs. If you choose that however, then some players might not be able to play the audio track. So please be aware of that. echo ffmpeg -i "$f" -acodec: copy -vn "$bn.mka"
ffmpeg -i "$f" -acodec: copy -vn "$bn.mka"
echo "      ##### already done. #####"
Not the answer you're looking for? Browse other questions tagged 14.04 mkv ogg-vorbis or ask your own question. How to convert ogg to aac music format? mp3 to ogg converter plugin for rhythmbox or banshee? how can i convert a 9.5 gb mkv file to mpg or avi with avconv? How to convert .mkv to .mp4?